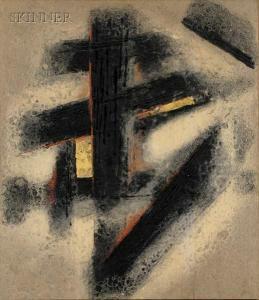 Find artworks, auction results, sale prices and pictures of Kasugai Masayoshi at auctions worldwide. BY MASAYOSHI KASUGAI (JAPAN,B. 1921). Handmade paper, signed lower right. Abstract in layers of coloredpaper. 59 1/2"h. 35 1/4"w., in a frame, 60 1/2"h. 36 1/4"w.
Condition reports are available on all items. Please note:unless a condition report is requested, we do not post detailedcondition information about each item sold. If you choose to bidwithout requesting a condition report, you are accepting the item"as-is" with no gaurantees. 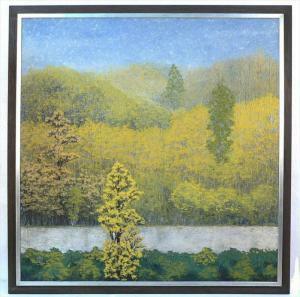 A large work, applied natural fibers on canvas depicting a river landscape. Bearing the artist's cypher at the lower left corner. Please see the gallery letter included in the lot. 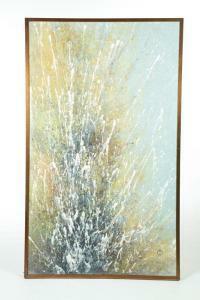 58" x 60", the frame 64" x 66". Excellent, minor wrinkles to areas of the canvas. From a Saddle River, NJ estate. composition on panel, "Radiant Form"
overall painting size: 32" x 31.75"
weeks of the auction end. 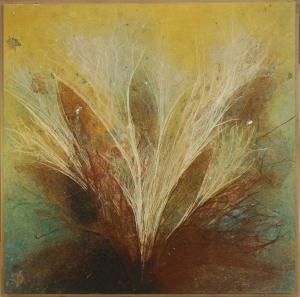 Handmade paper composition with foil laid onto board, 33 1/2 x 29in. 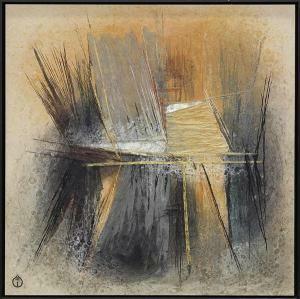 (85.1 x 73.7 cm), framed. Staining predominant to the u.r. and l.r. quadrants.